The program encourages communities to mentor black and Hispanic youth, in order to give kids a better chance at success. 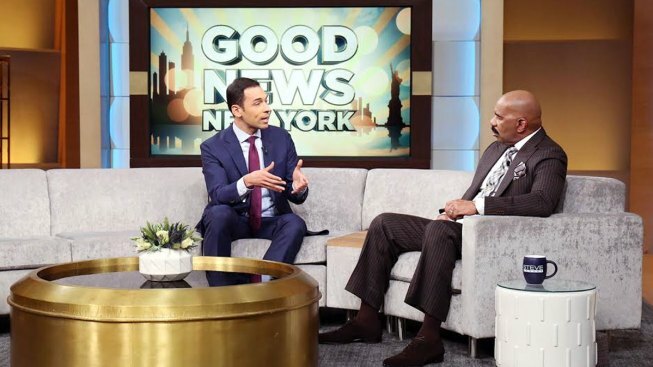 Tune in to “Steve Harvey” on Thursday, Jan 12 as as WNBC news anchor Stefan Holt visits the set to bring viewers a "good news" story NBC 4 New York recently profiled. Holt will highlight an inspiring initiative called “My Brother’s Keeper,” which was started by President Obama. The program encourages communities to mentor black and Hispanic youth, in order to give kids a better chance at success. One community just outside of New York City – New Rochelle, NY – has seen tremendous success with the program, resulting in higher graduation rates, increased morale and a stronger bond between the community, schools, local law enforcement and local businesses. "There's so much bad news out there. So when you find a good story about an entire community coming together to make the world a better place it's inspiring," says Holt. "In New York in 2015 only 65 percent of black and Latinos students graduated from high school. After New Rochelle high school took on the 'My Brother's Keeper" challenge they had 90 percent of students graduate." Tune in Thursday to hear more on "Steve Harvey." Check local listings for airing ties.